Woha. It’s been such a long time since my last post. More than 2 years have passed since then, I’m now a PhD student in computer vision at Inria and I hacked on quite a bunch of projects. Weirldy enough I did not do much pure software stuff (probably because I already code quite a lot for my research), but spent a lot (I mean, most) of my spare time on more hardware or hardware-oriented things, mostly in the scope of hackEns, the ENS hacking club we founded in October 2010. Among other projects, we built a RepRap 3D printer, a Mendel one, in early 2011, with a first successful print on April, 22nd, 2011. A friend and I quickly started the replication process, building two Prusa i1 printers in August-September 2011 using plastic parts printed just-in-time with the Mendel. 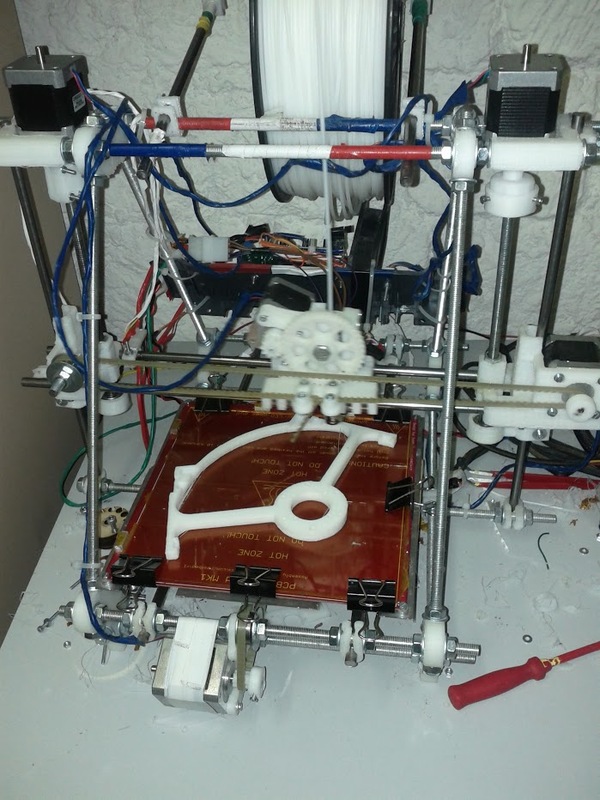 We continued the replication process with Jacques-Henri Jourdan, who slowly built a Prusa i2 starting early 2012, with a first successful print in late 2012, using plastic parts printed with my Prusa i1. That’s a beautiful chain of 3 generation of 3D printers. Over the builds, we have been amazed by the progressive technological improvements and the true capacity of the machine to auto-improve itself. During summer 2012 I almost reprinted all my printer plastic parts (the original ones were a little dirty and had clear defects that affected print quality), progressively transforming my Prusa i1 into a Prusa i2. One of the most striking things is that a 3D printer can produce better parts than the ones it is made of (and I’m not just talking about upgrades, but also about the print quality). What’s also amazing is how fast the software side of 3D printing is evolving. Slicing, which is the operation of transforming a 3D object description in a printer-friendly list of commands, is definitely a non trivial task, both on the fundamental algorithmic side and on the engineering side. Indeed, it is done by slicing the object into successive layers along the Z axis and then computing where plastic should be deposited on this 2D layer, which requires a lot of geometrical computations and careful coding to correctly handle edge cases. Skeinforge was the first software I used to slice my objects, which was later improved upon in a fork known as SFACT. However these python-based approaches were quite slow overall (partly because of the language itself, partly because of the design decisions such as a complete modularity which might not be the best for such a software), and a few months later a new candidate appeared, Slic3r, developed from scratch in Perl with speed and efficiency in mind, and is now regularly evolving with better core algorithms and GUI features. The possibility to print objects and the availability of 3D sensors such as Kinect (and software such as Kinect Fusion) has pushed replication possibilities way further than what we could have dreamed of 10 years ago. And for the hackers, it is now possible to build complex 3D objects from scratch, without having to painfully machine wood or metal by hand or with super-expensive CNC tools. If Thingiverse (or should we call it Makerbot Thingiverse now ?) is full of cute or pretty designs, it has also become a home for DIY hobbyist and hackers. 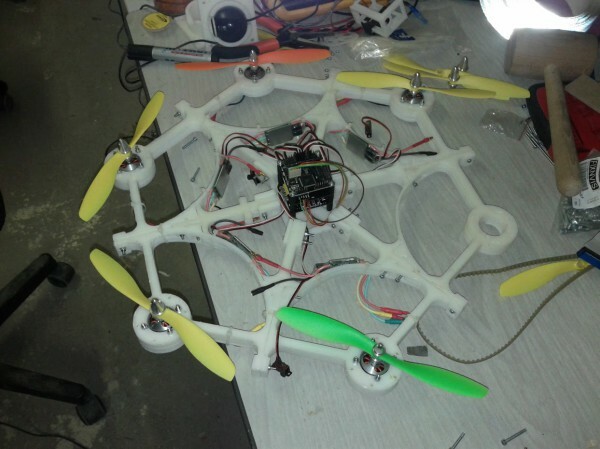 Coming from a pure CS background with little engineering knowledge, we were able to develop a hexacopter (a multirotor unmanned aircraft with 6 engines) frame from scratch, printing it with our 3D printers and flying it (but I’ll tell you more about this project soon). The only sad thing overall is that some people are trying to leverage the interest in 3D printing technologies to make a lot of money by selling crappy printers. The number of 3D printer crowdfunding attempts which were started on Kickstarter is just unbelievable, often promising things that cannot be achieved with the technology they are using (like printing super huge objects which are not hollow without a proper heating chamber) or just trying to sell existing designs at crazy prices. It’s also sad how Makerbot is getting all the good press while at the same time they are going further and further away from the open source approach, but that’s another story. 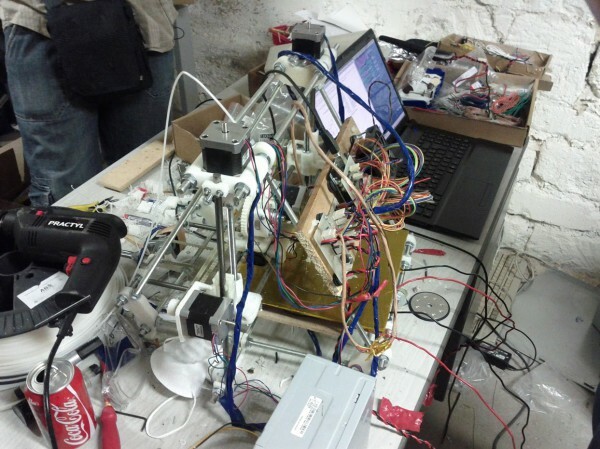 This entry was posted on Friday, May 17th, 2013 at 2:37 pm	and is filed under ~home, hackEns, RepRap. You can follow any responses to this entry through the RSS 2.0 feed. You can leave a response, or trackback from your own site. Entries (RSS) and Comments (RSS). 30 queries. 0.114 seconds.